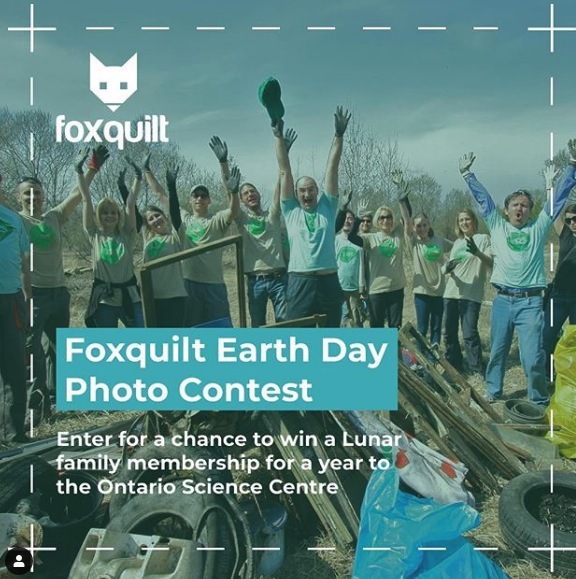 Enter the Foxquilt Earth Day Photo Contest for your chance to Win a Lunar Membership Pass to the Ontario Science Centre. Contest is open only to legal residents of Ontario who are 18 years of age or older. To enter you have to post a photo with you and at least one other person showing “how you make the Earth and its environment cleaner” tagging @foxquiltden. You also have to be following the official Foxquilt Instagram account for your entry to be eligible. Contest ends on April 30, 2019 at 11:59 pm. The winner will be the participant with the highest number of likes at the end of the contest period. The prize is a Lunar family membership for a year to the Ontario Science Centre. The Foxquilt Earth Day Photo Contest opens on April 4, 2019 and closes on April 30, 2019 at 11:59 p.m. The winner will be the participant with the highest number of likes at the end of the contest period.